Leaflet and Flyer Printing in Cirencester : Busy Fingers 01285 656757 Printers in Cirencester. In Cirencester, BUSY FINGERS COPYING & LEAFLET PRINTING provides leaflet and flyer printing. It is possible to look at our design portfolio for leaflet and flyer designs. Inserting them in a newspaper or a magazine and placing them in restaurants or libraries is possible and effective. They always provide the highest quality labels in the material of your choice. Call BUSY FINGERS COPYING & LEAFLET PRINTING today on 01285 656757 for a fast quote. Do You Know How to Choose the Size of Flyer or Leaflet Printing? Based on a number of factors, the size of the flyer or leaflet should be chosen carefully. 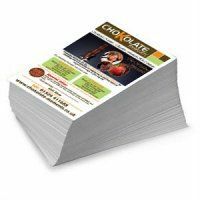 In general, sizes of leaflets and flyers vary from A6 up to A3. If you want a flyer that can be used to promote club nights, new products or services, and local businesses in Cirencester, the A6 size is ideal. You can use a leaflet of A5 size for a truly professional look. Choose its size depending on your budget and type of promotion. In Cirencester, BUSY FINGERS COPYING & LEAFLET PRINTING provides leaflet and flyer printing. It is possible to look at our design portfolio for leaflet and flyer designs. Inserting them in a newspaper or a magazine and placing them in restaurants or libraries is possible and effective. They always provide the highest quality labels in the material of your choice. Call BUSY FINGERS COPYING & FLYER PRINTING today on 01285 656757 for a fast quote. A poorly designed flyer or leaflet can spoil the reputation of the organisation, so consider some tips to make them attractive. Give attention to the theme and headline, which should be interesting with a good message. Different layouts with attractive colours, designs and images should be used depending on your target audience. Details should also be provided such as contact information, offers, and any extra information. Use standard graphic designing software available in Cirencester for great results.